Electric fireplaces are a convenient way to enjoy a warm night by the fire inside your home, even if you don’t have a proper fireplace and chimney. Electric fireplaces can be placed anywhere and don’t require venting. Some models are fairly portable, so you can warm up only the room you’re in. We researched dozens of electric fireplaces to identify which model was the best available online. We looked at all price ranges and sizes, from the small and inexpensive to the large and luxury models. We found out how many square feet each model could warm and compared its appearance. The Duraflame DFI020ARU-A004 Electric Fireplace Insert w/Heater stood out as a clear winner in its class. It has hundreds of positive reviews from satisfied customers. It’s also freestanding and easy to assemble on your own. The Duraflame DFI020ARU-A004 Electric Fireplace Insert w/Heater is an excellent choice if you’re looking for an electric fireplace. It’s an affordable, freestanding electric fireplace that you don’t have to install with a permanent hookup. You can put it in an existing fireplace or use it on its own by plugging it into a regular 120-volt outlet. It’s a feature-driven model that comes with a remote control. You can use it with the heat or without the heat and just the beautiful flames. It can heat an area of up to 400 square feet with the 1,350-watt heater that delivers up to 4,600 BTUs an hour. If you’re interested in a permanently installed recessed electric fireplace, the PuraFlame 33″ Western Electric Fireplace Insert with Remote Control is a good bet. 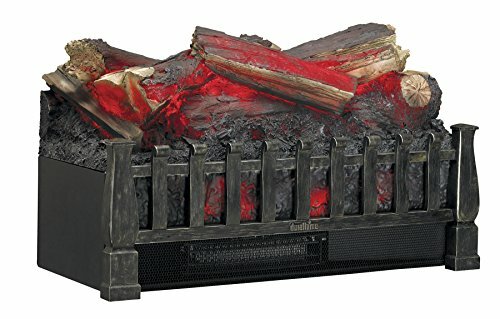 It is a beautiful insert with realistic flames and resin logs that make a welcome addition to any home. Its interior features a flattering brick wall design. It is available in three different sizes: 26″, 30″, and 33″. The fireplace uses energy efficient LED technology. It also features electronic temperature control and an adjustable thermostat that can be precisely set to 60 degrees to 84 degrees. The Touchstone 80001 Wall Hanging Electric Fireplace is an excellent option for those looking for a luxury looking electric fireplace at an affordable price at $280. Unlike with our top pick, which is just an insert, you can install the appearance of a whole fireplace with this wall mounting model. Its large 50″ panel with five flames enables you to change its brightness to suit your needs. It is available in 4 finish options: ivory, mirror, onyx, and stainless steel. It has a high and low heat option that can heat up to 400 square feet. It has a built-in timer and auto-shutoff feature that enables you to safely use the electric fireplace when you want to use it. The Southern Enterprises Redden Corner Electric Fireplace TV Stand is elegant, multi-functional, and luxurious. It is a large corner model that can also serve as a TV stand. It looks beautiful and homely, with two color options of Espresso and White. Unlike some of the other electric fireplaces on this list that rely on LED technology, the Southern Enterprises Redden Corner Electric Fireplace TV Stand uses Quarts infrared to heat large rooms up to 1,000 square feet quickly and efficiently in a way that retains more humidity and better distributes heat. It has 5-way adjustable settings, an automatic shutoff, downlight, and remote control. The Dimplex DFI2310 Electric Fireplace Deluxe 23-Inch Insert, Black is an excellent choice if you have an existing built-in fireplace that you don’t get to use. It is a simple insert that is easy to install into an existing opening. Its petite size fits the majority of fireplace openings. It is a 1,375-watt model that has a built-in fan-forced heater to push the heat into the room. It features three heat options: Full Heat, Half Heat, and Flame Only, so you can control the amount of heat. It has 4,695 BTUs. An electric fireplace is an ideal solution for homeowners and apartment renters without an existing fireplace. Since electric fireplaces do not have to be permanently installed, a portable option is great for renters who would not be able to change the structure of their apartments. With a small square footage, a high quality electric fireplace might help them save money on their electric bills by using the electric fireplace instead of using central heating. For homeowners, an electric fireplace is an effective way to add value without permanently installing a chimney or changing the roof and structure of the home. Some models look like built-ins that can create a focal point in the room. Portable models can help homeowners reduce their electric bill by only heating up the room they’re in instead of the whole house. Wall hanging. It is fairly easy to install a wall hanging model and it can be easily taken with you if you move to a new house or apartment. However, it will require wall space to hang. Recessed wall fireplace. A recessed wall installation requires you to cut a large hole in your wall to permanently install the electric fireplace. Portability. Some models are smaller, on a stand, or on wheels. If you plan to move the electric fireplace around, you’ll want to choose a model that’s more affordable. Realistic flames. A realistic looking flame is more interesting to look at. If you’re looking to make a visual statement with your home’s decor with the fireplace, look for an electric fireplace that features realistic flames. Variable heat settings. With variable heat settings, you’ll have the option to choose how hot it gets when its on. Installation. Since most people try to install an electric fireplace on their own, it’s important to choose a model with easy and clear installation instructions. Color or metal options. There are electric fireplace models that come in a wide range of finishes, from bronze and silver to wood and white. Square footage. You’ll want to carefully review how many square feet the electric fireplace covers and compare it against the size of the room where you plan to use it to make sure it can heat up a room of that size. LED bulbs. LED bulbs are a nice feature for an electric fireplace, as the bulbs are energy efficient, will last a long time, and cool if you touch them. Timer. A timer can enable you to have the electric fireplace automatically turn on or off, depending on when you want it to. Remote control. A remote control enables you to turn on, turn off, and adjust the settings of your electric fireplace without having to walk over to it to adjust these settings. BTU. BTU is a standard measurement of heat. The higher the BTU, the more heat it can produce. Size options. Some electric fireplaces come in various size options, which means you can choose the best size for your actual space. What is an electric fireplace and how does it work? Electric fireplaces are a type of electric heater that looks like and provides many of the benefits of a traditional wood- or coal-burning fireplace. Because it doesn’t create carbon monoxide from burning organic materials, it doesn’t require venting. The electric fireplace pulls in cool air and heats it using a heating coil before using a fan to push the hot air back into the room. Sometimes people will install a recessed electric fireplace into an existing fireplace structure to get more use from the fireplace without the mess of a traditional fireplace. Can you leave an electric fireplace on all night? It is safe to leave an electric fireplace on all night, though you will want to take the same safety precautions you’d use when operating any other electric device. This includes limiting unsupervised access to the unit for children and pets. Unlike space heaters, where there are hot coils exposed, most electric fireplaces have glass plates that separate the heat source from the rest of your room. You may not want to leave an electric fireplace on overnight because of how hot it can make the room. There are electric fireplaces that have timers and auto-shut off sensors to turn it off. These models can make it easier to keep your living space at the right temperature. How much does it cost to run an electric fireplace? The cost of running an electric fireplace depends on the model you choose. Various factors, including bulb type, energy efficiency rating, size, and other features. Generally, an electric heater costs around $25 a year to run. However, this does not take into account any money you’d save by lowering your electric bill each month during the winter. If you relied on your electric fireplace to heat up the room you’re sitting in instead of using your central heating to heat up your entire home, you will use less energy overall. This makes an electric fireplace a more cost effective option. Do you need a chimney with an electric fireplace? Electric fireplaces rely on electricity to generate heat, whereas traditional fireplaces burn logs of wood to generate heat. When wood burns, it produces smoke that requires venting through a chimney. Since electric fireplaces do not actually burn anything, they do not need a chimney to vent the smoke out of your home. We looked at 20 other electric fireplaces. Even though they didn’t make our 5 best electric fireplaces list, they’re the best of the rest and each is still a great option for your home. The information you’ll need to compare each one is included with the listing. The Ameriwood Home Overland Electric Corner Fireplace can fit into your home decor by sliding into the corner and doubling as a TV stand. The large 23-inch screen gives you better visibility with a high-quality AltraFlame effect. It supports TVs that are up to 50-inches wide and weight up to 55 pounds. The Real Flame 5950E Chateau Corner Electric Fireplace also fits in corners but fills deep corners better due to its full triangle shape. It comes with a 1,400-watt heater that creates enough comfortable heat to fill a room without drawing too much power. You can also control it with the included remote control, allowing you to stay comfortably seated where you are and still have full control. The Windsor Corner Infrared Electric Fireplace Media Cabinet 23DE9047-PC81 can be used as either a wall unit or a corner unit depending on your needs and how you configure it. It comes with the materials needed for both. The 23-inch flame insert provides enough heat for 1,000 square feet, which makes it a great option for large rooms in colder weather. If you want to create your own electric fireplace unit, the AKDY 23″ Black Freestanding Electric Firebox Fireplace Heater Insert W/Remote is the best place to start. It matches the industry-standard 23-inches used in electric fireplaces but is just the insert. You can install it in any unit that has greater than 24-inches of open space. The screen is made of tempered glass, which makes it resistant to heat and physical damage. This Ashley Furniture Signature Design – Small Electric Fireplace Insert offers a smaller option for creating your own electric fireplace. It is slightly smaller than standard models at 22-inches, which means you are more likely to find the right stand to fit it. It has an LED display for better clarity and longevity and comes with a remote control with six preprogrammed temperatures. If you have a fireplace unit with a larger opening, you can use the ClassicFlame 25EF031GRP 25″ Curved Electric Fireplace Insert with Safer Plug. It has a larger 25-inch body for a wider screen. It can heat 400 square feet of space and can be installed without venting or gas lines. With the SpectraFire Plus system, you can build a custom fire with 125 design options. You can create a larger, built-in fireplace with the ClassicFlame 36EB110-GRT 36″ Traditional Built-in Electric Fireplace Insert. It comes in a more traditional and 120V design, but there are 240V and more contemporary options as well. The larger 36-inch body gives you a large screen that can run with or without the heat. That way, it is useful year-round. The Golden Vantage 28″ Freestanding Tempered Glass 5200 BTU 1500-watt Adjustable Electric Insert Stove Fireplace w/ Remote Control can be used in a unit, but it is also a portable unit of its own. The fire brightness is adjustable, which makes it possible to set a brightness based on the day or the room. This unit has an extra safety device, a thermal safety cut-off switch so that it can shut down quickly if the heat gets out of control. The Valuxhome Houselux 36″ 750-watt/1500-watt, Electric Fireplace Insert adds a level of classiness that you may not find in other models. It uses realistic brick shapes on the sides and backdrop of the fireplace, which gives it a closer appearance to a real fireplace. It has multiple heating options so that you can use it any time of year, and uses LEDs to give you better clarity in different light settings. Wall mounted electric fireplaces like the Gibson Living Liberty 50 Inch Electric Wall Mounted Fireplace in Black can greatly change the appearance of large and small rooms. It is much bigger than a wall or corner unit at 50-inches long. You can still mount it under a TV though as long as it has 36-inches of clearance. With a 50-pound weight, it can be mounted in most walls with the appropriate support systems. When you’re looking to add a bit of flair to a room, you can use the MFE5048WS 50″ Cynergy Built-In Wall Mounted Electric Fireplace. It is wide like many other wall mounted fireplaces, but it is only 4.9inches tall. That way, it won’t take up a lot of verticle space while adding to the atmosphere of the room. At 39.7 pounds, it is easier to mount to different wall styles as well. You can use the Moda Flame Houston 50 Inch Electric Wall Mounted Fireplace Black as an accent piece in rooms to make them cozier. The integrated heater is perfect for cold nights and seasons without the need for additional fuel sources. This fireplace comes with the mounting hardware and can be mounted under TVs and other items provided that it has 36 inches of clearance. The ability to install an electric fireplace can change the flow of a room, but the Napoleon NEFL50FH Allure Linear Wall Mount Electric Fireplace can do so without sticking out of the wall. It can be fully recessed into the wall without needing an open-access heat vent. It also uses high-intensity LEDs for the best view regardless of the lighting conditions. This model is only 5-inches deep, making it one of the slimmest options that you can find. The PuraFlame Alice 40″ Recessed Electric Fireplace makes it easy to add a fireplace anywhere. It has a thin design to limit the depth that it needs to stick into the wall. The fuel bed contains LEDs that can create 13 different color options. The remote uses an LCD screen for easy viewing in dim light, or you can use the body mounted touchscreen controls. When adding power, you can either plug it in or have it hard wired based on your needs. 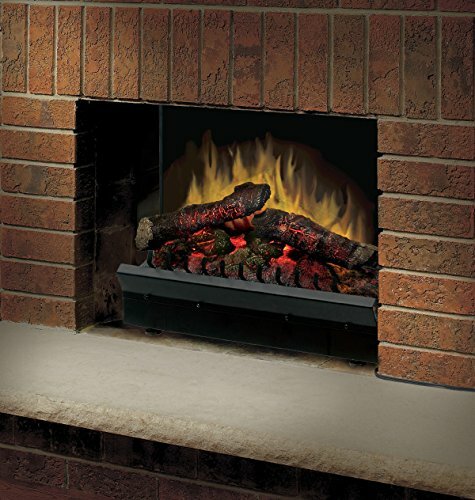 The R.W.FLAME 50” Recessed Electric Fireplace offers several easy to use and customization features. The flame bed contains LEDs that can make 12 color combinations to meet your style and mood needs. It also has an integrated timer that can automatically shut it off whenever you set it. The controls are easy to operate with a simplified remote and touchscreen buttons. It also has better energy saving features with a 750-watt or 1,500-watt fan heater and sleep modes to conserve power. 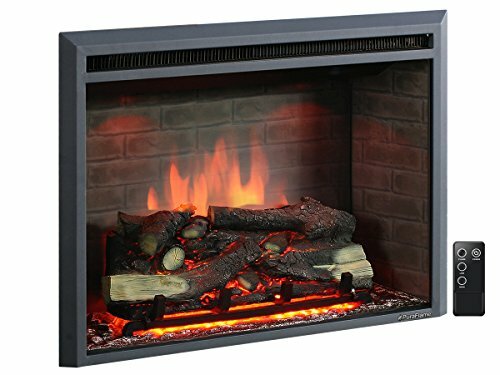 This Regal Flame Rigel Black 50″ Pebble Ventless Heater Electric Wall Mounted Fireplace can give you what you need to set the mood. It has four color options in the red and blue spectrums to match the color temperature of your room. The heater has multiple settings that let you choose just how warm it gets. At 46 pounds, it can be mounted in most walls with the right hardware. The BEAMNOVA 50″ Electric Wall Mounted Fireplace is smokeless and ventless because it does not have an additional power source. With a built-in timer, you can program it to turn off automatically in up to 7.5 hours making it a set it and forget it appliance. The lights used to create the 3D flame effect or cool LEDs making it safe for children and pets to be around. This unit uses a standard 120V plug for power rather than being hardwired. That way, anyone can mount and use it without the need for specialized assistance. If you do not want to install a recessed fireplace, choose the Best Choice Products 50″ Electric Wall Mounted Fireplace. It mounts on the wall but not inside the wall with the appropriate included hardware. That makes it easier to move and lets you install it on practically any existing wall as long as it can support the weight. The heat and brightness are adjustable so that you can get the best experience any time of year. This unit is smokeless and ventless for a clean and enjoyable fireplace experience without the hassle of other fuel sources. It has a large faceplate as well so that it hides the backend components and gives it an overall large appearance. For a different look, try the Best Choice Products 50″ Electric Wall Mounted Fireplace. It has a black glass finish that gives it a bright, clear, and glossy look. Bright LED lights create a realistic flame effect. The 1,500-watt, 5,100BTU heater can heat a room up to 400 feet and has an adjustable temperature for maximum comfort. The deep red flame is realistic and adds a level of visual warmth to the room. For an option that doesn’t have to be recessed and can give you a simple design, try the XtremepowerUS Allure Linear Wall Mount Smokeless Electric Fireplace. It has a blue and red flame design that can combine to make purple flames as well. The design is 6.5-inches thick, which lets you partially recess the installation. A 1,500-watt heater paired with a circulation fan disperses heat with greater efficiency.